Christie's sale of magnificent jewels in Geneva achieved a total of more than $78M, the highest result for any jewellery auction ever held by the auction house in Switzerland. The top lot was a 56 ct heart-shaped diamond, which sold for more than $10M becoming the most expensive heart-shaped diamond ever sold at auction. Accompanied by report no.5121769493 dated 5 January 2011 from the GIA Gemological Institute of America stating that the diamond is D colour, Internally Flawless clarity, with Excellent polish and Excellent symmetry; and a letter stating that the diamond is Type IIa. Heart-shaped diamonds are often referred to as an extremely popular fancy cut and the ultimate representation of love. The most romantic of all diamonds, they are highly sought-after for very special occasions such as engagements and anniversaries. Diamonds became popular as ornaments in jewellery in the 1400s and the different techniques and styles of diamond cuts were gradually developed over many years. In 1475, Lodewyk van Bercken (or van Berquem), a Flemish stone-polisher from Bruges, introduced the concept of absolute symmetry in the placement of facets on the stone. His minutious and precisely studied advancements resulted in the first pear-shaped Pendeloque or Briolette-cut, a revolutionary breakthrough on shape, design and cutting excellence. The Heart-cut can be closely related to the Pendeloque. 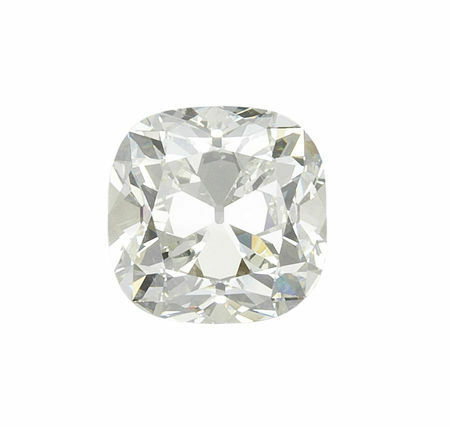 Its appearance often begins as a pear shape, the possible inclusions located ideally in the center of the rounded end that the diamond cutter will flatten and indent with a cleft, the girdle widened until the length is approximately equal to the width. It is essential for a heart-shaped diamond to have a highly skilled cutter, to insure that the distinctive lobes are balanced, smooth and well defined, while retaining a brilliant shine. 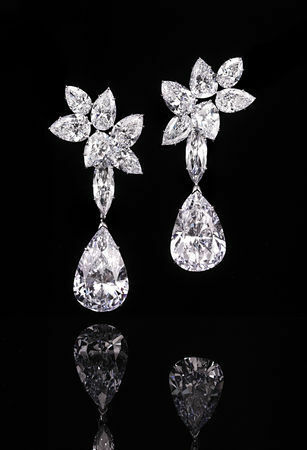 Consisting of minimum fifty-eight facets, the result is full of fire, comparable to the traditional round brilliant-cut. According to gemmologists, the ideal length-to-width ratio of a heart-shaped diamond should be approximately 1 to 1 in order to exhibit the best possible brilliance. However, there are many heart-shaped diamonds which are cut much narrower and much wider than the ideal proportions, primarily depending on the attributes of each particular rough diamond, making of every perfectly cut hearts a rarity. 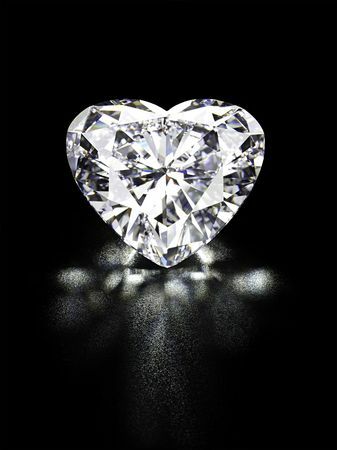 The 56.15 carat heart-shaped diamond presented today exhibits all the characteristics of perfection. It is of D colour, Internally Flawless clarity, Excellent polish and symmetry, and belongs to the elite of the Type IIa diamonds. A cushion-cut Burmese sapphire of 130.50 cts sold for US$ 7,122,742, achieving a new world record price for a sapphire at auction. And report no. 11020001 dated 7 February 2011 from the Gübelin Gemlab stating that the sapphire is of Burmese origin, with no indications of heating; and an Appendix indicating that the sapphire 'possesses a richly saturated and homogeneous colour, combined with a high degree of transparency, and a finely proportioned cut.'. Set with a rectangular-cut fancy intense blue diamond, weighing 6.60 carats, flanked by two trapezoidal diamonds, weighing 0.91 and 0.90 carat, mounted in gold, size 6¾ Esrimate CHF4,000,000 - CHF6,000,000 ($4,537,063 - $6,805,594). Price Realized CHF4,803,000 ($5,469,429) to a Private ($828,000 per ct). Blue diamonds have long been considered among the rarest gems. In recent years, prices of blue diamonds have dramatically increased, setting new auction records every year. On 20 October 2010, in New York, Christie's established a new world record price for a blue diamond when a 10.95 carat triangular-cut Fancy Vivid Blue diamond sold for $15,762,500 or $1,439,497 per carat. Most blue diamonds belong to the semi conductive Type IIb category, a group where the distribution of the boron atoms in the structure of the diamond crystal, is responsible of their blue colour. Situated along the Krishna River valley near Golconda in India, the Kollur mine is reputed to have produced the first blue diamonds ever discovered. In the mid-17th Century, French traveller and gem merchant Jean-Baptiste Tavernier frequently visited this region and witnessed the mining of some of the most important historical blue diamonds such as the Tavernier Blue, the Hope and the Idol's Eye. Discovered in 1903, the Premier mine (now renamed the Cullinan) in South Africa, known to have produced the largest diamond ever found, the 3,106 carat Cullinan, is considered today as the most significant source of blue diamonds. Other countries such as Guinea, Sierra Leone, Borneo, Brazil and Venezuela have also produced blue diamonds but in less quality and quantity. Less than 0.1 of all diamonds yielded worldwide show a blue appearance. Most of them weigh less than 1 carat, are included and they often show a secondary less attractive grey hue (e.g., greyish-blue). 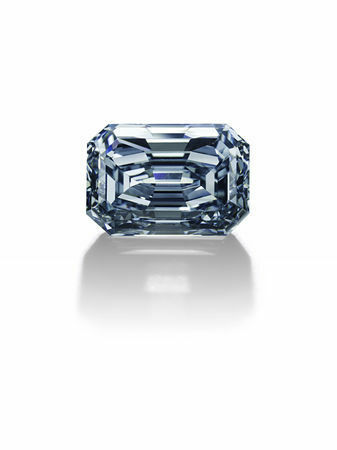 It is therefore exceptionally rare to find a 6.60 carat Fancy Intense Blue diamond of Internally Flawless clarity and a privilege to offer for sale such a gem of excellence. 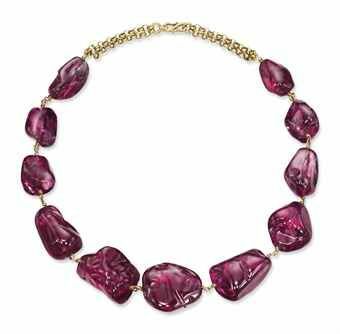 An Imperial Mughal spinel necklace sold for US$ 5,210,902 setting a world record price for any Indian jewel at auction. Mughal emperors have had, for centuries, a particular love for precious stones. The references found in numerous memoirs and chronicles of this period show the strong cultural belief in gemstone properties. The Timurids, ancestors of the Mughals, had begun the tradition of engraving titles and names on stones of outstanding quality and, along with diamonds and emeralds, large spinel beads were certainly their favourite. Emperors were commissioning special officials to search for spectacular stones with no expense spared, that they would then wear in multpiles to adorn their outfits. 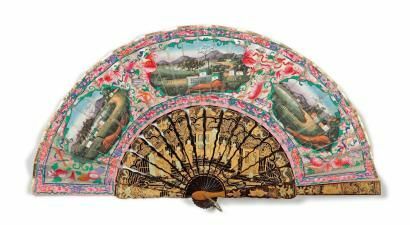 As much as these gems were a symbol of the opulence and dignity of the empire, they were also treasured as protective talismans. These spinels were mainly originating from the Badakhshan mine, in the 'Pamir' region (on the frontier between Afghanistan and Tajikistan). This province gave its derived name to spinels, described as 'Balas rubies' for decades. The chemistry would demonstrate during the 19th Century that spinels and rubies are two different gems, but for long, any red stones were described as 'ruby'. Hence, it is interesting to note that among the most famous historical engraved spinels are the 'Timur Ruby' (in fact a spinel), now in the Royal Collection of HM Queen Elizabeth II of England. Its numerous and long inscriptions give a rare insight into its history, including the name of Emperor Jahangir, and although it is now known that the stone is a spinel, its name has not been changed. Another important engraved spinel is the Carew Spinel, currently in the V&A Museum, inscribed with the names of Emperors Jahangir, Shah Jahan and Aurangzeb. Akbar the Great (1542-1605), third Mughal emperor, collected spinels, wearing them most often directly on the skin, as a 'life-protector' for their blood-red colour, mounted as pendants or bazubands (upper arm bracelets), or simply holding them in his hand. A legend says that the Rulers were to wear three spinels during battles to protect them from injuries and death. Akbar's son, Emperor Jahangir (1569-1627), followed the family tradition as a great connoisseur of gems, and was even described by a contemporary English visitor, the Rev. Edward Terry, as the 'greatest and richest master of precious stones that inhabits the whole earth.' (Pal, op. cit., p. 131). His legendary passion was continued by his son, Shah Jahan, (1592-1666), best known for constructing the Taj Mahal at Agra, one of the most romantic and magnificent architectural wonders in the world, and then to his successor, Emperor Alamgir (1618-1707), also known as Aurangzeb. Inscribing a gemstone with an emperor's name, often with his lineage and dates, was a mark of appreciation for the exceptional beauty of the stone and bestowed on it respect and imperial dignity. 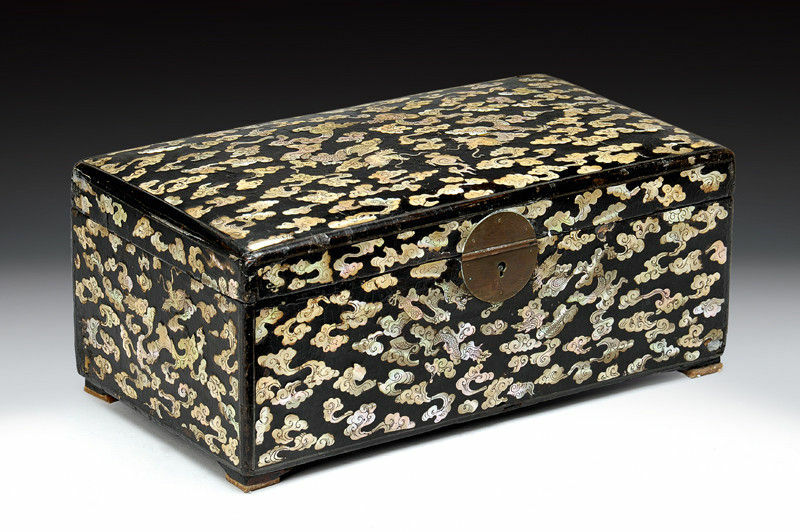 Sometimes it was engraved with the name of more than one emperor as it was passed on from father to son. They were usually drilled through the center and strung onto necklaces, the largest being drilled from side to side on one end and used as pendants. After the fall of the Mughal Empire, in 1857, some of these drilled stones were remounted, such as the present necklace, most probably mounted during the 19th Century. Out of the eleven stones, three are engraved with the name and lineage of their owners: two are inscribed with the name of Emperor Jahangir, with different dates corresponding to the beginning of his reign, and one is inscribed with the three names of Emperor Jahangir, Emperor Shah Jahan and Emperor Aurangzeb. Important engraved spinel beads are scarce. A very fine collection can be seen in Qatar where the Museum of Islamic Art exhibits an important necklace with eleven Mughal spinel beads, for a total weight of 877.23 carats, three of them engraved with the names of Emperor Jahangir and one with that of Emperor Shah Jahan. The auction of the present necklace, comprising a total of 1,131.59 carats, is an exceptionally rare opportunity for any collector to own a museum quality Mughal jewel. 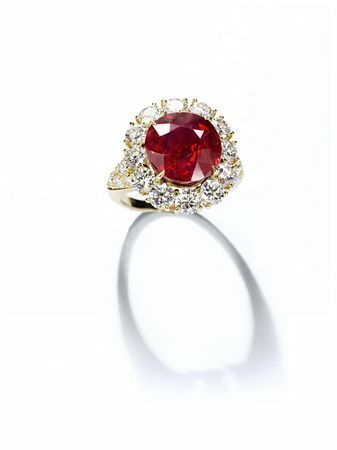 A Superb Ruby and Diamond Ring, by Van Cleef & Arpels. Jean-Marc Lunel, Head of the Jewellery Department, Christie's Geneva: “Quite exceptional prices were achieved at the May 18 auction in Geneva. An antique spinel necklace engraved with the names of the most prominent Mughal Emperors, created a world record price for any Indian jewel at auction selling for more than $5 million. A Burmese sapphire of 130 cts also made a world record price of $7M. The market is particularly keen to buy quality diamonds in all sizes and colours, exemplified by a 56 ct heart-shaped diamond which brought more than $10M in the most successful Christie’s jewellery sale ever held in Geneva. 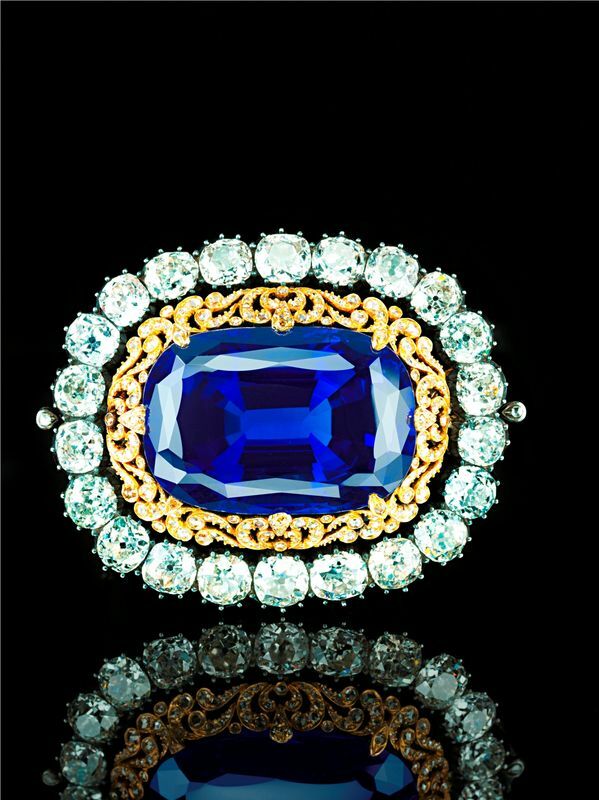 We now look forward to our jewellery auctions in Hong Kong, Paris, London and Milan over the next month”.